Unburned carbon and sulfur in the fuel burned in oil furnaces, often in the form of black smoke filled with particles, is called soot. The two main reasons that oil furnaces produce soot is puffback and the accumulation of soot in venting flues and chimneys. Unburned oil on the bottom of the combustion chamber of the furnace can ignite, causing an explosion called puffback. The explosion can disconnect the flue vent connector, also called the stack pipe, causing soot to blow through your house. The three main reasons for incompletely burned oil that causes puffback are a leaky fuel line, a bad shut-off valve, and when the nozzle that shoots oil into the furnace becomes clogged. If the pipes that carry oil to the burner leak oil when the furnace is not running, air may enter the burner where it is compressed. When the burner stops running, compressed bubbles of air expand, pushing heating oil into the chamber where it accumulates. When this pool of oil ignites, it explodes as puffback. A spring-loaded valve in oil furnaces quickly and securely stops the flow of oil when the furnace is turned off. A small amount of dirt in the seat of this valve can cause oil to leak onto the floor of the combustion chamber, which is a puffback waiting to happen. If the spray nozzle that shoots oil into the burning chamber becomes partly blocked, not all of the oil sprayed into the chamber is burned. This, too, can cause unburned heating oil to accumulate on the bottom of the furnace--a potential cause of puffback. 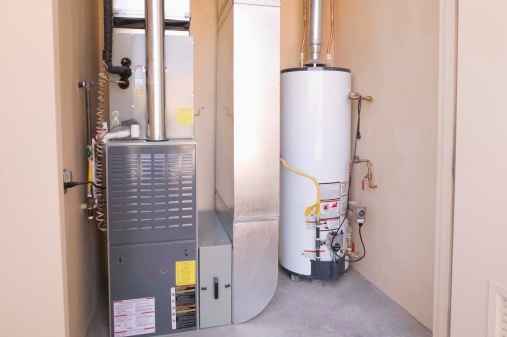 A "puff" or small "bang" when your furnace starts means that unburned oil is likely being ignited. If your oil furnace makes a soft rumbling sound when you turn it off, it might not be shutting down completely, and oil is accumulating on the bottom of the burner. If you see soot on top of your furnace or black stains on the walls of ceilings around the furnace, a more serious soot problem may be developing. Soot gathers at the base and on the walls of both metal flues and masonry chimneys that vent smoke from oil furnaces. If the base of a metal flue is not cleaned, the soot can burn, producing toxic carbon monoxide that can spread through the ducts to all parts of your house. Metal furnace flues often direct smoke to masonry chimneys. Sulfur residues also can cause cracks in metal venting flues, resulting in soot leaking into your home. Water moisture condensing on the inside of masonry chimneys can cause joints to erode and crack. Soot can leak into your home from these cracks. What Causes Furnace Puff Back? What Are the Dangers of Oil Furnaces?